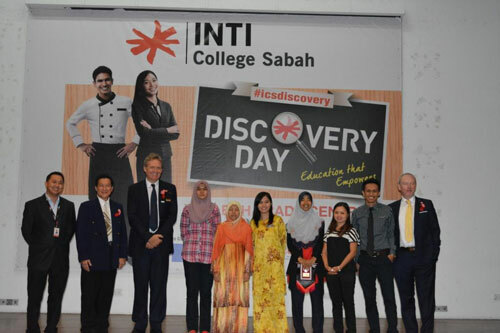 Two highly experienced and qualified speakers provided the highlights for INTI College Sabah’s Discovery Day, which saw over 300 students from secondary schools in Kota Kinabalu and Penampang learning about educational and career opportunities in business and hospitality. Dr McIver (right) and Pennington (3rd left) with INTI College Sabah management team members and secondary school counsellors. Providing insight into a range of Business and Finance degrees from the United Kingdom’s leading business-facing university was Dr Malcolm McIver, Director of Studies at the University of Hertfordshire. A 25-year veteran in higher education, Dr McIver outlined how students could earn a prestigious degree from the University of Hertfordshire without having to set foot in the UK. “Students at INTI College Sabah studying on one of the University of Hertfordshire’s degree programmes such as Accounting, Accounting & Finance, Business Administration or Event Management & Marketing will be taught the same content as students in the UK, undergo exactly the same assessment process as students in the UK and receive exactly the same degree certificate from the University as students in the UK. And they can do this without incurring the high cost of tuition and living expenses usually associated with pursuing a tertiary level qualification abroad. Students can now have a British degree for a Malaysian price, and, if they want a British experience, with our Semester Abroad Programme they can study at the University in the UK for an entire semester with no additional cost to course fees,” said Dr McIver. Andrew Pennington, Dean of the School of Hospitality at INTI International College Subang, drew on over two decades of experience in the hospitality industry to create awareness of the tremendous opportunities available in the sector. Having served in managerial positions in hotels, clubs and restaurants in Hong Kong, Taiwan, China, Dubai, Oman and Europe, Pennington endorsed the hospitality programmes offered at INTI College Sabah which are recognized by the Malaysian Association of Hotels Training and Education Centre (MAHTEC). “INTI Sabah’s Diploma in Hotel Management programme, which is offered in collaboration with the Malaysia Centre for Tourism & Hospitality Education (MyCenTHE), has a distinct advantage over others of its kind, as the college enjoys good relationships with leading hotels in the region. This enables students to undergo training with hotels such as Hyatt Regency Kinabalu, Le Meridien Kota Kinabalu and Shangri-La’s Tanjung Aru Resort & Spa, which gives them a head start in learning about the inner workings and requirements of world-class hotels,” said Pennington. Tertiary education at INTI College Sabah is shaped by an ideal balance of theoretical knowledge and practical training. Students will be trained to develop leadership qualities, confidence and resourcefulness, as well as learn how to analyse, strategise and make quick decisions. They will also gain valuable exposure outside the classroom with partner establishments that include 5-star hotels and multinational organisations.